Attorneys spend a considerable amount of time in school learning how to become great litigators. However, litigation and negotiation are completely different. Financial negotiation uses financial analysis, not legal theory or arguments, to provide a path out of commercial debt. 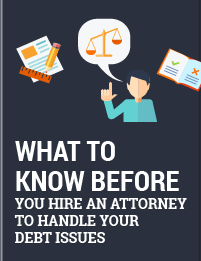 Download our FREE guide of questions you should ask in order to evaluate if an attorney is the right fit to address your commercial debt needs!